LMS Chairman: Can the Traditional Mass preserve orthodoxy? Can the Traditional Mass preserve orthodoxy? for the Conversion of England. Michael Dougherty has written (in The Week, largely reproduced on 1 Peter 5) that the current crisis in the Church arises out of a failure to centre the Faith on Christ. The Traditional Mass is Christ-centric, and in the writings of Cardinal Ratzinger we find powerful arguments that the Ordinary Form is much less so. Ratzinger explains the Christocentric meaning and influence of a series of features of the Traditional Mass which have been lost, or usually lost: the silent canon, the priestly prayers, and celebration ad orientem. “I am convinced that the ecclesial crisis in which we find ourselves today depends in great part upon the collapse of the liturgy, which at times is actually being conceived of etsi Deus non daretur:as though in the liturgy it did not matter any more whether God exists and whether He speaks to us and listens to us." In short, the Traditional Mass can help to restore the Church's lost balance. He doesn't actually answer the question, but makes a perfectly valid point: the rot was setting in a long time before Vatican II and the Novus Ordo Missae. As regular readers know, I am in complete agreement about that. But we need to make a crucial distinction. The Modernist heresy of the late 19th and early 20th centuries was the heresy of an intellectual elite. It had no popular roots or manifestation. It opposed, in fact, popular Catholicism: it sought to ridicule the traditional stories of the saints, popular devotions, and the faith of the simple believer. When Pope Pius X suppressed it, as far as open discussion went, it famously went 'underground'; this meant its proponents often conformed outwardly but continued to spread their ideas on the quiet, in intellectual institutions - seminaries and Catholic universities. Modernists were so successful in capturing these institutions, in fact, that by the time of the Council a very large number of theologians and even bishops had been influenced decisively by ideas connected with Modernism. But it still was not a popular movement. This is made perfectly clear in the writings of the liturgical reformers, who again and again lament the liturgical and devotional preferences of the laity, as had the more progressive members of the Liturgical Movement in the preceding decades. From the 1950s attacks were increasingly made on popular devotions and beliefs from sophomoric clergy and forward-thinking journalists, and of course they have been at it ever since. What has happened after the Council is a mind-bending collapse in belief and practise by the ordinary laity. There is certainly a story to be told about the 'new catechesis' imposed after the Council, but the liturgical reform also had a part to play. The connection of either of these with the documents of the Council, of course, is a complex question. So yes, there was a long period of preparation, but something huge happened in the wake of the Council. The interested question, which I have discussed more than once on this blog, is the relationship between liturgy and catechesis. Could the old catechesis have held things together with the New Mass? We certainly hear a lot in official documents about post-Conciliar problems arising from liturgical reforms because of a 'failure of catechesis'. But the fact is that the liturgy is a supremely powerful means of conveying the fundamental theological orientation of the Church to the Faithful. If the liturgy is strongly Christocentric, our weekly liturgical experience will embed that in our hearts and souls: unless we are intellectuals consciously fighting against that. If it is not strongly Christocentric, then it won't. 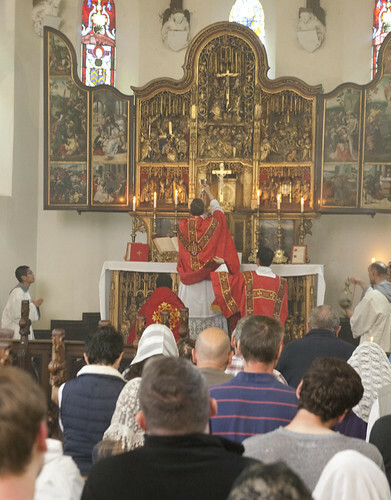 If, as Cardinal Ratzinger suggested, typical Novus Ordo celebrations can end up looking as though it is the community, and not God, which is being worshiped, then clearly we have a problem. The basic theological orientation of the ancient liturgy is a massive fact which effects even the most unsophisticated church-goer. There are a number of other connections between the Traditional Mass and orthodoxy, some of which I explored in a series under this label. There is matter of the orthodoxy of the texts, which speak to us from the age of the Fathers of the Church. I wonder if in the crisis of today more orthodox Catholics can see that the systematic elimination from the Ordinary Form of theological themes at odds with the tenor of the modern world was not such a great idea. The themes included grace, penance, sin, judgment, and the intercession of the saints. It is not that people are incapable of distinguishing doctrine from liturgy, or are ignorant that the liturgy of the mid 20th century was not identical to that celebrated by the Apostles. ... It is, rather, that the institution they want us to believe in doctrinally also brought us this ancient liturgy. If the liturgy is rubbished, then the Church is rubbished. The Church loses her credibility. If you lose your credibility, you don't lose it selectively: people say, 'if he was deluded or a liar about that, I won't believe anything he says any more.' That's what the liberals wanted people to say about the Church, and to a tragically large extent they succeeded. And there is the issue of the conversion of hearts which the ancient liturgy can bring about. There are, in fact, endless things to say on this topic. I might say a few more of them in future posts. The Modernist heresy of the late 19th and early 20th centuries was the heresy of an intellectual elite. This crystallizes the essential point about the Revolution of the 1960's: It was a clerical revolution. Our own Trahison des Clercs. It might have been a revolution not entirely unwelcome, or at least not hard to adapt to, by some western middle class Catholics, especially those in Protestant dominant societies (the Anglosphere, Germany, the Low Countries. etc.) where they were finally "arriving" in the cultural and economic mainstream. But it was still a clerical led revolution - not even a majority of the clergy, but certainly a large enough critical mass of clergy in key positions. Remaking the liturgy, then, was a project about cementing the revolution with the Church's "working classes" - the lower clergy, but above all the laity. This allowed the Modernist Revolution to succeed with the laity where, say, the Arian Movement failed. So no, traditional liturgies cannot always prevent a defection of elites. That will always be a danger. But it has done a pretty good job of anchoring the faith of the flock. And that is why it will be an essential element of the Church's restoration, when the time comes, just as it already is for intentional traditional communities steadily emerging at the Church's margins. I feel celebrating the EF is not per se preserving orthodoxy but rather it creates a spirituality of orthodoxy, it calls us to something: rubrical conformity and obedience is one obvious example. it is that opens us up to orthodoxy and to a sense of theological continuity. It is the 'giveness' of the Rite (and therefore of the Church) that I find both stimulating and attractive, and though I celebrate the OF ad apsidem, and possibly with a stricter attendance to the rubrics than might be considered usual there isn't the same sense of obedience, or for that matter of continuity. I've thought of it as having a championship-winning football team. If the coach suddenly institutes new practice drills - say skipping around the field and blowing bubbles instead of blocking drills - it really shouldn't be a shock when the team proceeds to suddenly lose all of its games even though it has the same players. The collapse of Catholic life after Vatican II and the new liturgy underscores the importance of the traditional liturgy rather than make it irrelevant. Does Tradition preserve us, or we the Tradition? To what do we stay faithful? Was Constantine the Great a Clericalist?